Yesterday we recipes for a particular “good luck” food to celebrate the new year: black-eyed peas, a southern U.S. tradition. Today’s tip: Check out more lucky foods from around the world, and enjoy some on New Year’s Eve or New Year’s Day. Some are ancient traditions, others relatively new. Pick, choose and adapt your own lucky food traditions for the new year. In parts of Europe, cabbage, collards, kale and chard are consumed for luck because their green leaves look like folded money (who doesn’t want good fortune in the new year?). In Denmark, stewed kale is eaten, sprinkled with sugar and cinnamon (hmmm….). In Germany, sauerkraut is the veg of choice. In the southern U.S., it’s collards. Suggestion: Pick your green, and make it a tradition; or feature a different one each year. 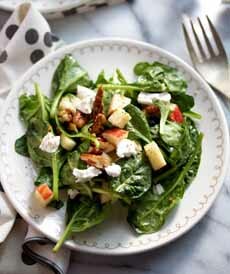 You can start with a crisp spinach salad with a warm bacon vinaigrette. Cod has been a traditional feast food since the Middle Ages; and the Catholic Church’s policy against red meat consumption on religious holidays helped make all fish commonplace at feasts. For the new year, boiled cod is popular in Denmark. In Italy, baccalà, dried salt cod, is a traditional food. Herring is consumed at midnight in Poland; in Germany, it’s likely to be carp. In Sweden, the smorgasbord provides a variety of fish dishes. In Japan, herring roe is consumed for fertility, shrimp for long life, and dried sardines for a good harvest (sardines were once used to fertilize rice fields). Suggestion: With so many delicious fish and seafood dishes, you can present a new one each year. That includes sushi or sashimi and caviar (we purchased salmon roe and wasabi tobiko). In Spain, each celebrant consumes 12 grapes at midnight—one grape for each stroke of the clock. Each grape represents a different month; the goal is to swallow all the grapes before the last stroke of midnight. It’s not an ancient practice, but dates to 1909, when grape growers had a surplus of inventory. They promoted the idea, and it became a tradition, spreading to Portugal and some parts of Latin America. Suggestion: Consider ramekins of mixed grapes, frosted (sugared) grapes. Or perhaps start your own tradition with grape granita or a frozen Grape Margarita. Popular from Europe to Asia, legumes—beans, peas and lentils—are symbolic of money. An Italian double-lucky new year’s tradition, sausages and green lentils (cotechino con lenticchie), features a second lucky food, pork. Germans have lentil or split pea soup with sausage. In Brazil, the traditional first meal of the new year includes lentil soup or lentils and rice. In Japan, sweet black beans (kuro-mame) are consumed during the first three days of the new year. Suggestion: Along with yesterday’s black-eyed pea recipes—all of these are delicious choices, but we’re going for red bean ice cream instead of the kuro-name. You can also add beans to a spinach salad. Pigs came to symbolize progress: They push forward, rooting themselves in the ground before moving. With its rich fat content, pork also signifies wealth and prosperity. That’s why roast suckling pig is popular new year’s fare in Austria, Cuba, Hungary, Portugal and Spain. Austrians even decorate the table with marzipan pigs. Swedes choose pig’s feet, Germans feast on roast pork and sausages. We wouldn’t turn down a pork roast, porchetta or a baked ham. Suggestion: For an easier path, add bacon or pork belly to the spinach salad. Cakes and cookies. Cakes and other baked goods are served around the world, with a special emphasis on round or ring-shaped items. In Italy, that means chiacchiere, honey-drenched balls of dough fried and dusted with powdered sugar. In Hungary, the Netherlands and Poland, donuts are customary (Holland also has ollie bollen, puffy, donut-like pastries filled with apples, raisin and currants. Some cultures hide a special trinket, coin or whole nut inside the cake; the person who gets it will be lucky in the new year. Suggestion: Avoid broken teeth and choking hazards. Serve cookies or an easy bundt cake. 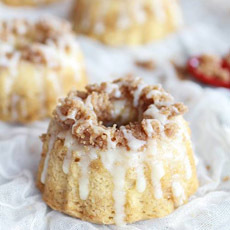 What could be more appropriate than egg nog bundts? Chicken: It scratches backwards, symbolizing setbacks. Flying birds (duck, pheasant, etc. ): Good luck could fly away. Lucky foods for the new year:  Start with a spinach salad, with bacon for extra luck (photo courtesy Evolution Fresh). 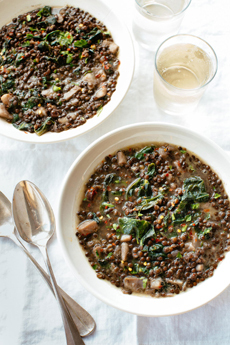 For the soup course, lentil or bean soup with ham or pork sausage and mustard greens (photo courtesy Good Eggs). 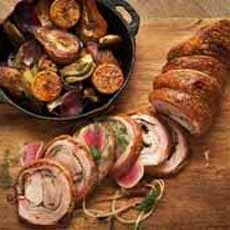 For the main course, porchetta, or a simple roast pork loin (photo courtesy Il Buco | NYC). Something round for dessert: mini egg nog bundt cakes. Here’s the recipe from Eat Wisconsin Cheese. 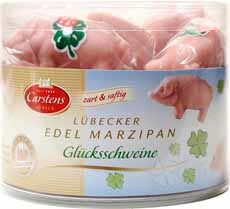 Marzipan pigs for everyone (photo Premier Food & Beverage).